I am no professional when it comes to ballhawking. In fact, there are studies out there that you can look up. But since I am terrible with math, I will tell you about how I do it. In the last five games in which I attended the game early for batting practice, I have gotten four balls. None of these balls have come by catching it. But catching a ball is still the ideal way to get a ball. Positioning yourself in a spot in the outfield where you can easily move around is the best bet. 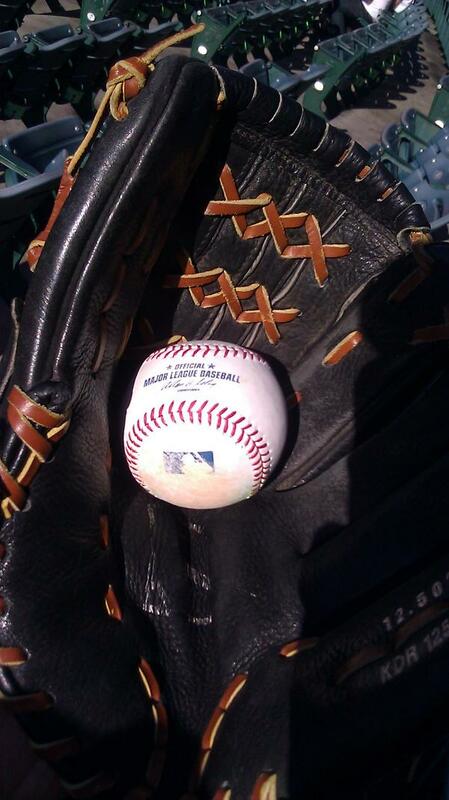 Thanks to Evan Scribner for this ball I got on Saturday. Bring a glove. This is the most important rule. You may think you can catch a ball with your hands alone. But if you want to stand out and give yourself the best chance, you bring a glove. Plus, players are more likely to throw a ball to someone who can catch the ball with a glove than risk it being dropped. Wear the opposing team’s colors. I know you may not like the sound of that, but it makes it easier. During batting practice, most times it is the opposing team on the field. Therefore, the players are more likely going to toss the ball to their own fans. You don’t have to wear official team merchandise (unless you are going to a visiting park). But if the opposition is the Orioles, how about an orange shirt? Or if the Dodgers are in town, wear blue. For me, when I go to A’s games in Anaheim, I’m always in my A’s gear. If you do go that route, go with a bright color. I go to Angels games a lot to watch the A’s when they come into town. I always wear a yellow shirt. A green shirt is fine to wear, but when a player is trying to pick out a fan in the stands, the brighter color is easier to identify. So look for the brighter color in thew team’s color scheme. It makes a difference. Position yourself near the foul territory area, preferably near the foul pole. Either there or the bleachers is the best bet. You can yell to the players and they can hear you and the throws aren’t too far for them. Know the players’ names. This is probably the biggest key to the entire experience. To get the attention of a player, you should call out their name. To make it more endearing, call them by their first name only. That will help you stand out and for them to locate the one fan who actually knows their name instead of just reading the nameplate on their jersey. Wave your arms when they are looking in your general direction. Add that with the bright color, the glove, the first-name calling, a player out in the field is much more likely to identify you over somebody else. That may help you get a ball thrown your way. That’s what I did on Saturday and Evan Scribner saw me and threw a dart 30 yards right to my glove. Piece of cake. Now if you are unsuccessful during batting practice, hope is not lost. If you so happen to sit right behind the dugout area for either team, you may still get a ball during the game. In between innings, players are likely to throw a ball into the stands right behind the dugout. If you apply the aforementioned strategies (bright color, glove, waving arms, first name-calling) there’s a chance that a ball might be throw in your direction. Last year when I went to a game and sat behind the A’s dugout, three balls were thrown in my direction. I didn’t get to any of the balls (since I already had a ball from BP that day) but it’s a strategy that works. Now if you can’t afford a seat behind the dugout, take a look at the starting lineup and see who’s coming to the plate. If it’s a lefty-heavy lineup, then be around the second deck towards the third base foul territory. The opposite applies for a righty-heavy lineup. Foul balls are likely to be hit in that direction. Just get yourself in a position to move around if you need to chase a ball down. Other than that, it all comes down to chance. It’s not an exact science, but it helps a little to know where to be and how to act. At least that’s how it has worked for me. This entry was posted in MLB and tagged Ballhawking. Bookmark the permalink.